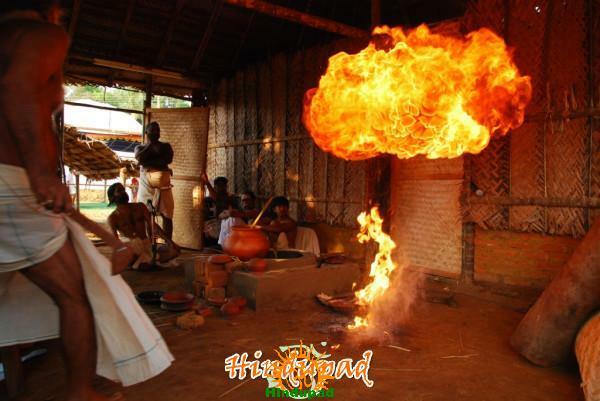 Panjal Athirathram, held between April 4 and 15 in 2011, is one of the biggest and ancient Vedic ritual in the world. Here are some photos or images of Athirathram 2011. Sandeep Varma who is updating us about the event has published many photographs in his blog. One of the best images of Athirathram is of a huge ball of fire erupted out of the Mahavira pot which was photographed by Artist Gireesan Bhattathiripad who has been participating in the event since the beginning. In his blog, Sandeep Varma is updating the information and images of Athirathram daily. “Gireesan is one of the very few people to be allowed inside the yagashala who are not directly involved in the performance of Athirathram. His role is to number the tiles used for Shianachithi and also draw sketches of Bull (It symbolises the arrival of Bull, the carrier of Lord Siva on day one when the Shianachithi layer is laid out. The Bull waits for Him till the last layer is laid); Vyaali (Dragon face seen in the entrance of temples seen as good omen, this is drawn on the Chithi entrance); and Vikarni on the tiles used for the main altar. He uses dissolved rice power to make the drawings. Gireesan has been roped in by the organisers of Athirathram, Varthathe Trust, to also shoot the ritual. Gireesan has already shot over 2000 photographs and would have shot 3-4 thousand more by the end of Athirathram.